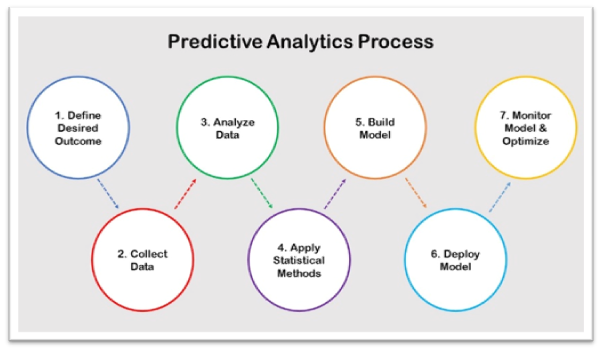 Predictive analytics is defined as “the use of data, statistical algorithms and machine learning techniques to identify the likelihood of future outcomes based on historical data (Source: www.techemergence.com)” . In warranty marketing, predictive analytics can be used to drive higher quality leads, develop more relevant messaging, lower customer acquisition costs, and maximize customer lifetime value. A propensity model, or “likelihood to buy” model, is a model that predicts which prospects are more likely to purchase a warranty product. It scores prospects based on how closely they resemble customers who have purchased warranty products in the past. Propensity models are built from large data sets that contain demographic variables , such as age, gender, zip code, etc., as well as transactional variables, such as product, price, date, etc. A modeler will run various statistical analyses to determine which variables are most highly correlated with purchase. The result will be a model that compares the variables or “attributes” of prospects against the customer data set and gives them a “likelihood to purchase” score. How this model optimizes marketing spend: Propensity models are extremely useful because they allow marketers to group prospects into segments based on high, medium or low likelihood to purchase a warranty. Marketers can then target the highest propensity prospects first, versus marketing to the entire prospect list, minimizing spend and maximizing ROI. In addition, marketers may decide to send the high propensity group multiple offers across multiple channels, knowing that they represent higher quality leads. CLV is defined as the “monetary value of a customer relationship, based on the present value of projected future cash flows from the relationship (Source: Wikipedia)”. This is an important number for warranty marketers because it represents an upper limit on what they should spend to acquire a new customer. How this model optimizes marketing spend: Being able to accurately predict the future dollar value of a customer is an incredible asset. Warranty marketers can use CLV, together with the propensity score, to determine how much to spend on customer acquisition efforts. As a result, warranty marketers can better forecast budgets, minimize acquisition costs, and maximize ROI. 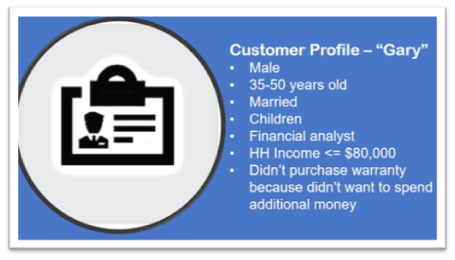 Customer profiles are descriptions of your customers based on a set of attributes. Customer profiles – also called “buyer personas” – provide the foundation for more personalized one-to-one marketing. Warranty marketers group customers according to shared characteristics like income, age, life stage, job or location. They can even group customers based on shared purchase motivations. As an example, a warranty marketer for an auto manufacturer may have a customer profile named “Gary” with the following characteristics: male, between 35-50 years old, married, children, financial analyst, and household income of $80,000 or less. This customer does not initially purchase a warranty because he is concerned about spending extra money. So, for targets with this profile, the most relevant messaging might focus on how warranties can save customers thousands of dollars in costly repairs; and imagery on the email or letter might show a man whose car broke down driving his son home from baseball practice. How this model optimizes marketing spend: Developing customer profiles and grouping targets with similar characteristics helps warranty marketers develop the most relevant messaging, imagery and tactics for each group. 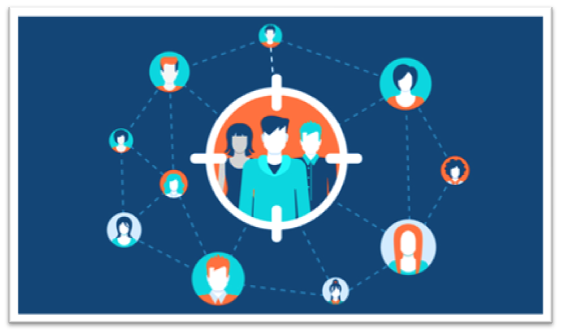 Customer segmentation drives more personalized marketing – and the result is increased response rates, sales and ROI. After, Inc. is a global leader in warranty services, offering predictive analytics, data-driven marketing, and program administration. Click here to learn more about our Warranty Marketing Services.